Put the wheels in motion for a day of family fun when you pick up this SPRING CertifiKID deal for The Capital Wheel and Carousel at National Harbor! But you'll need to hurry! This limited time offer won't last long. Make some memories at The Carousel at National Harbor! Enjoy the 36-foot Americana-themed Carousel with unlimited rides! Take a spin on a traditional horse, or get wild with a polar bear, dragon, hummingbird, and more! 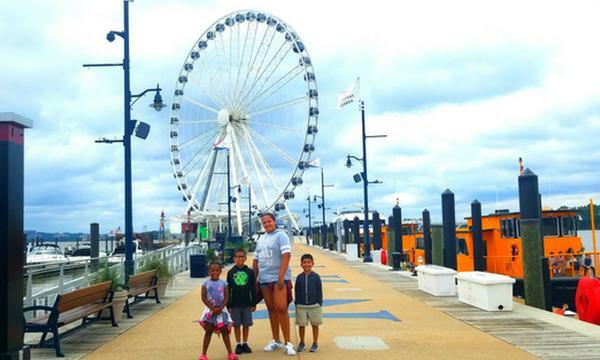 After, head over to The Capital Wheel, National Harbor’s 180-foot observation wheel. Take in the sights of National Harbor and surrounding areas from your private fully enclosed, climate controlled gondolas. Situated at the end of a pier, The Capital Wheel provides incomparable views of the Potomac river, surrounding Maryland and Virginia countryside, and even the Washington Monument. Make a day of it...stay and enjoy the playground, waterfront, spring blooming flowers and family-friendly and kid-favorite eateries & shops! Cupcakes...Ice Cream...Peeps, anyone? All photos courtesy of The Capital Wheel at National Harbor. HURRY! Limited time offer, don’t delay! The Deal: $13 for One Capital Wheel and Carousel Combo-Package Admission at National Harbor ($24.20 Value - 47% Off). Valid Friday - Sundays only from April 19 - May 19, 2019. No limit to the number of vouchers you can purchase! Fun for ALL ages! All taxes are included in deal price. For calendar listing daily Capital Wheel operating hours, click HERE. Each flight on The Capital Wheel lasts approximately 12-15 minutes. Capital Wheel Spring hours are Friday-Saturday-Sunday from 12pm - 10pm. Also open Monday - Thursday with variable hours from 12pm - 10pm. Parents accompanying a child to The Carousel at National Harbor do not require a Carousel ticket. Carousel Spring hours are Friday-Saturday-Sunday from 12pm-8pm.